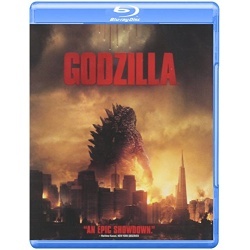 The king of all monsters returns in this Warner Bros./Legendary Pictures production helmed by Gareth Edwards (Monsters). As the story opens in Japan, we find dedicated nuclear power-plant manager Joe Brody (Bryan Cranston) so caught up in his work that he forgets it's his birthday. Sending his young son Ford off to school before reporting to the plant with his wife Sandra (Juliette Binoche), who works in the reactor, Joe begins to suspect that some suspiciously patterned seismic activity may be something more sinister than shifting tectonic plates He's right, too, because when the plant goes into meltdown mode and Sandra gets caught on the wrong side of the containment door, a massive cover-up ensues. Fifteen years later, Ford (Aaron Taylor-Johnson) has become a bomb-disposal expert in the U.S. military. He's just returned home to his wife Elle (Elizabeth Olsen) and their son Sam (Carson Bolde) when he gets word that Joe been arrested in Japan. Long estranged from his father, who was written off as a conspiracy theorist for his failed efforts to prove the Japanese government was attempting to hide something about the earlier disaster, Ford nevertheless ventures to Japan to get him out of jail, and reluctantly agrees to join him in traveling to their old home in the quarantined zone. Subsequently taken into custody, the pair end up in the very plant where Joe used to work, and where scientists Dr. Ichiro Serizawa (Ken Watanabe) and Vivienne Graham (Sally Hawkins) are studying a massive cocoon-like structure that appears to feed on radiation. The situation turns critical when the events of the present begin to mirror those of the past, and a terrifying winged-creature dubbed a 'MUTO' is unleashed. Meanwhile, as the military attempts to devise a plan to destroy the beast, signals indicate that it had been calling out to something before it broke free, and the scientists learn that it has awoken a towering, godlike leviathan that has lied dormant for centuries, and may be mankind's only hope for restoring the balance of nature. MONARCH: Declassified - Discover explosive new evidence not contained in the film that unravels the massive cover-up to keep Godzilla�s existence a secret. The Legendary Godzilla - Go behind the scenes with filmmakers and cast for an even deeper look at the larger than life monsters in the film.